Home / Scrollsaw Patterns / Clocks Scrollsaw Woodworking Patterns / Arts and Crafts Clock Woodworking Plan. 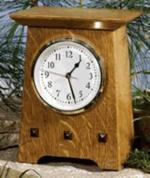 31-MD-00158 - Arts and Crafts Clock Woodworking Plan. We used white oak but you can use a wood of your choice. A full materials and supplies list is included with the plan. Table saw, band saw, drill press, disc and palm sander.